impact on a person's self-confidence and esteem. Not only are teeth important for smiling (aesthetics) and eating (function), but they also help support the lips and face. Missing teeth can result in difficulties eating, a selfconscious smile and a 'sagging face' appearance. in with the remaining natural teeth. Dr John Besford is one of the world's leading authorities on the provision of dentures. 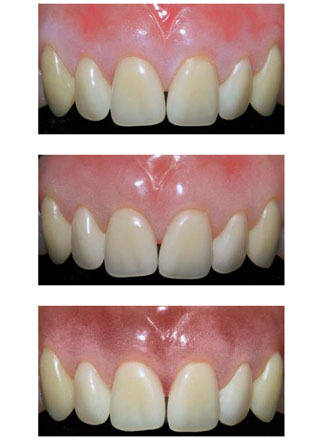 He has described the importance of using teeth of the correct size and shape since if they are too small then too much gum will be shown; of avoiding the teeth being set too far back and ensuring adequate support for both lips and face to avoid harsh, drawn and over old appearance and that dentures look unnatural when teeth are too uniform and the gums are too pink. 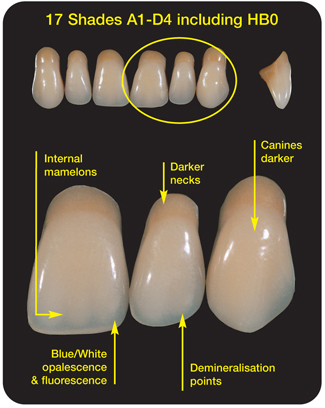 nature and so enable your clinician to provide the most cosmetic denture. Click on the World of Difference Patients programme to listen to Dr Besford. darker dentine covered with an enamel layer that is especially visible at the tip. The blue white opalescence reproduces the effect of that different structure. and have greater opalescence, whereas the eye or canine teeth are darker. dimensional - just like your natural teeth. tools for individual colouring of the base to harmonize with your natural gums. Examples are shown in the photos opposite. you to smile and enjoy life.